He died this past Tuesday at his home in Ishoej, south of Copenhagen. How good was Orsted Pedersen? In 1963, at age 17, he turned down an invitation from Count Basie to join his band. In 1973, at 27, he accepted Oscar Peterson's invitation to join his trio. Orsted Pedersen is pictured above with Peterson, photographed during a performance at Carnegie Hall. The bassist played on hundreds of records with, among many others, Toots Thielemans, Chet Baker, Lee Konitz, and Martial Solal. Here's his obituary as it appeared in Thursday's New York Times. Niels-Henning Orsted Pedersen, the famed Danish jazz bassist who performed with legends like Oscar Peterson, Miles Davis and Dizzy Gillespie, died on Tuesday at his home in Ishoej, south of Copenhagen. His manager announced his death to the Danish news media. Mr. Orsted Pedersen's career took off in 1962 when, at age 16, he played in Copenhagen's famous Montmartre jazz club, where American greats like Count Basie, the tenor sexophonist Dexter Gordon and the pianist Bud Powell performed. At 17, he turned down an invitation to join the Basie band. His international breakthrough came in 1973, when he joined the Oscar Peterson trio, which was produced by the jazz impresario Norman Granz. Mr. Orsted Pedersen was heard on hundreds of records and played with Toots Thielemans, Chet Baker, Lee Konitz and Martial Solal, among many others. Claus Vittus, a leading jazz expert with Denmark's public radio, called him one of the greatest jazz bassists in the world. From 1964 to 1982, he was a member of the Danish Radio Big Band and he also performed with the trumpeter Palle Mikkelborg and the keyboard player Kenneth Knudsen, both Danes. Mr. Orsted Pedersen is survived by his wife, Solveig, and three children. The greatest bassist on a full bass i've ever heard! Unbeleaveble what this man pleayed on his bass. I realize that this comment is coming very late after NHOP's untimely death but I would just like to say that I came to notice his unbelievable playing this past summer of 2007. I have been playing drums for 50 years and heard all I thought there was to hear until I heard him. He was truly one of the greatest. The answer is simple: NHOP WAS indeed probably the best bassist in the world. If you consider the following for evaluation: 1) Technique (probably parallelled only by Brian Bromberg); 2) Intonation (perfect! ), 3) Swing/feeling (utmost), 4) creativity (full of) 5) Knowledge of harmony (perfect) and compare it to all recorded bassists you have to admit it!. I am a pro pianist/guitarist/comp/arr from Paraguay. It is most obvious that Niels-Henning Orsted Pederson has displayed a level of creativity and unbounded talent that is rarely seen in jazz performances. 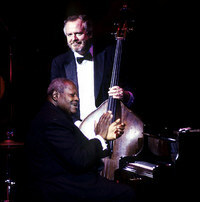 The videos that I have seen with Niels performing with Oscar Peterson serve as convincing evidence. He will be missed by all. It is virtually impossible to rank these genius musicians. Niels-Henning Orsted Pederson was certainly a great jazz bassist. I'm not questioning that at all. But it's really not possible for any of us to say who is or was "the world's greatest jazz bassist," only perhaps "my favorite jazz bassist of all the ones I've heard." First of all, "the world's greatest" would be a matter for history to decide, not for contemporaries, and secondly, unless we've heard every single one, how can we say which is the greatest?